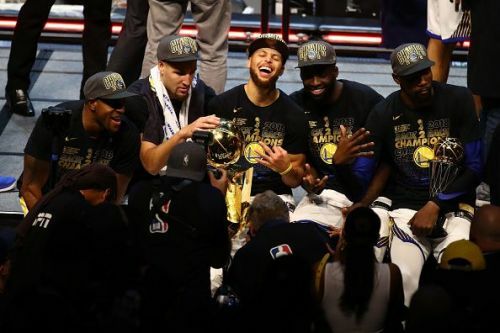 The Warriors have won 3 of the last 4 NBA championships and made it to each of the last 4 Finals series. Ever since Steve Kerr has taken over the reins of the team from Mark Jackson, the Dubs have been soaring sky-high, to the point that their 2017-18 record of 58-24 is by far their worst regular season campaign of the last 4. They won 67, 73 and 67 games respectively in the '14-15, '15-16, and '16-17 seasons. They added DeMarcus Cousins to their roster on the second day of the 2018 free agency window, and now sport a more dominant look than ever -- they could legitimately field an All-Star starting five the moment Boogie makes his comeback from the Achilles injury, which ruled him out of the latter half of last season. Russell Westbrook is probably the one player smarting the most following Kevin Durant's decision to sign with the Golden State Warriors in July 2016. The move essentially saw KD move from Brody's side to a team whose point guard is as fluent on the ball as he himself is fierce on his drives. While both Westbrook and KD are grown men and seem to have buried the hatchet (the All Star Weekends in 2017 and 2018 tend to drive this notion home), they would still be seeing each other 4 times a season. The Oklahoma City crowd will thus once more be hyped to cheer against a player, who was once their favourite son in their last matchup of the regular season. While the Warriors are clearly the better team, it is this dynamic that makes this matchup worth awaiting. 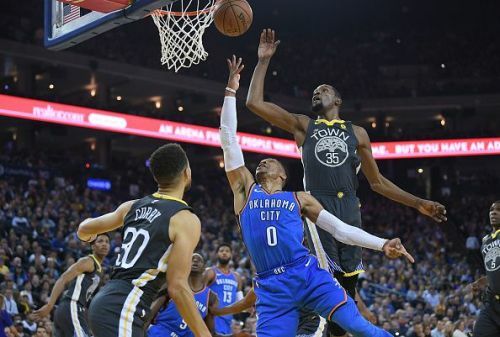 Note: The Warriors will also be hosting the Thunder on 21st November, who will play host to the Warriors at the Chesapeake Energy Arena on 16th March.